William Dean is not a local chocolatier, but they were at the SF Chocolate Salon, so I got to try a few of their products, including both truffles and bars. Key Lime: “White chocolate ganache infused with fresh lime juice.” Tasting notes: White chocolate shell with a pretty decoration stamped on top. Shell a little thicker than standard, not very sweet, lacking that “white chocolate” flavor. Ganache inside was not very smooth, an almost gritty consistency. It did have a decent lime flavor to it. Didn’t really enjoy this. Peanut Butter Crunch: “Milk chocolate and peanut butter with bits of peanut brittle”. Tasting notes: Milk chocolate shell, peanut butter filling, pretty design stamped on top. Really lovely honey roasted peanut flavor, nice crunch from the bits of peanuts in the filling. Like a sophisticated peanut butter cup! Berries & Pistachio Bar. Tasting notes: Plain white chocolate bar topped with assorted whole dried fruits and pistachio chunks. Fairly sweet decently creamy white chocolate. Dried blueberries had a nice texture and flavor, but the flavor was lost with all the sweet white chocolate. Perhaps enjoyable if you like white chocolate bars. Dinner at Lot 7, again! As you may know, I've replaced my foie gras crawl with an uni crawl. Not that I haven't been eating uni all along, as I generally order it whenever I encounter it, but now, I'm actively seeking it out. (Know of any great uni dishes? Let me know!) 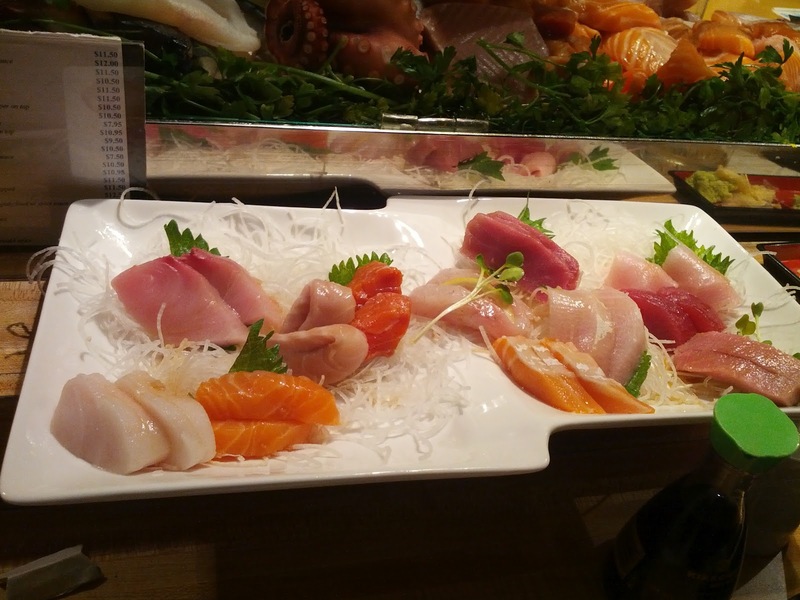 We started off the crawl last week with the simplest form, sushi at Zushi Puzzle. This week, we wanted to go less traditional. I recently saw a photo of an uni creme brûlée being offered at Lot 7. Oh, you know me and savory custards - this was right up by alley. 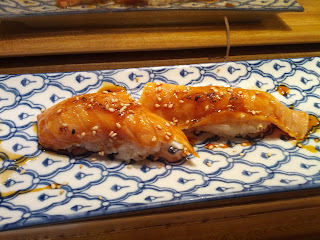 And, they also have local salmon on the menu, probably my favorite cooked fish these days. However, I'd went to Lot 7 3 months ago, and as I have a huge list of places I haven't yet been and want to try, I rarely return to place unless it was downright phenomenal, or special for some other reason, like being conveniently located or an old classic. Lot 7 was good, but it isn't convenient. On my previous visit, I did declare the crab cake to be the best crab cake I'd ever had. And, at the time, I declared the fish and chips to be the best I'd ever had (more recently however, I visited the east coast, and had some downright amazing fish and chips. Not really a fair contest, since they get to use fresh local haddock rather than rock cod, which is just a zillion times better. Know any other great fish and chips in the bay area? I'm also always on the lookout for those!). So, even though I wouldn't normally return, these dishes sounded like ones I would enjoy. But more compelling to me was the fact that the chef, Greg Lutes, really seems to care deeply about the evolution of his dishes, and I've been following his dish inspiration on his blog, iculinaire. And I was impressed with the quality of the seafood, the creativity, and the cooking execution last time we were there, even when it was really quite new. So, I decided to make the return trip, with my same dining companion as before, and two others, both of whom had just been at Lot 7 the week before, and liked it so much, that they wanted to come back a week later! Since I've already reviewed the restaurant once, I'll skip a general review this time, and focus only on the dishes we had. I left the restaurant feeling almost exactly the same as I did last time: this is high quality product, well prepared, expertly seasoned, served at moderate prices, in a casual setting with a great atmosphere, with a chef and owner who truly care about the experience they are creating. Such a rare combination. The food overall was even better this time, except, like last time, we really did not like the desserts. This is clearly not their strength. The most impressive part of our visit is that it managed to achieve yet another "best ever" status. As I said already, last time I declared it the best crab cake and the best fish and chips. This time, it was the best tuna tartare I've ever had. See below for the full details. I really wish Lot 7 was in my neighborhood, I honestly think I'd visit several times a month! I highly recommend, and I'll definitely be back. Dungeness crab mac ‘n cheese. $14. The first time I was at Lot 7, this dish caught my eye, as I do love both mac and cheese and crab. But, I also felt like it might be the sort of dish that sounds awesome, but often isn't, so we didn't order it. When I saw the owner eating it that night, I almost reconsidered, because if he was picking it, it must be good right? One of my dining companions this time had it before and loved it, and said that even though he just had it a week ago, he wanted it again. Clearly, we had to get it this time around. It was served in a giant ramekin, heaping full. The pasta was shells, one of my favorite form factors for mac and cheese. The pasta was cooked perfectly, not al dente, but not mushy, exactly how you want for mac and cheese. It had a nice crispy top layer. Served piping hot, clearly fresh out of the oven. The cheese sauce was a classic mix of cheddar and monterey jack, nothing fancy. Unfortunately, I really dislike monterey jack, so I didn't care for the sauce. It was really creamy, and the others really enjoyed it. 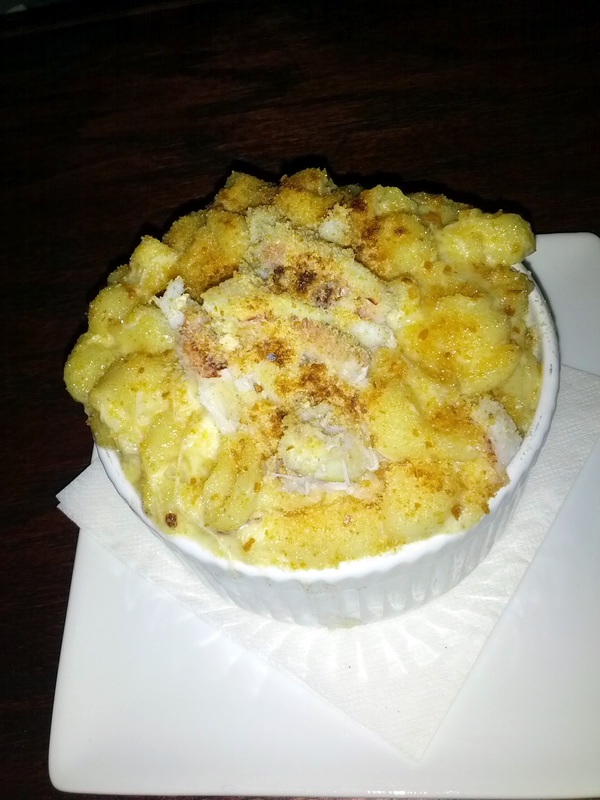 The crab came in several forms, some of it shredded up inside the mac and then some lump crab meat on top. There was a fair amount of it, but as expected, it was overshadowed by the cheese sauce. You weren't really ordering this to taste crab though. This was a well executed dish, but due to the monterey jack, just not one I really liked. My least favorite of the night, but second pick for the other diner who rated it. The serving size was enormous and $14 was a good price. 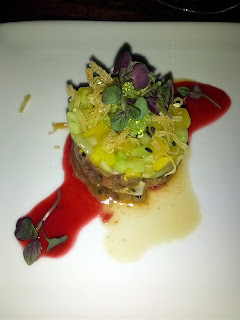 Ahi tuna tartare: ginger / toasted sesame / crispy lumpia / plum and sweet chili sauce. Next, we received a surprise from the chef, ahi tuna tartar! A few days prior, I had started doubting that I really liked red tuna, after a bunch of disappointing pieces at Zushi Puzzle. This dish totally changed my mind. It was the best tuna tartare I've ever had. The tartare was fresh and had a great ginger flavor in it. It came topped with cubed cucumber and mango, shredded lumpia, micro greens, and tobiko. The cucumber and mango were fresh, crunchy, and a great pairing. Like the tuna, they were light, and made this feel like a real summer dish. 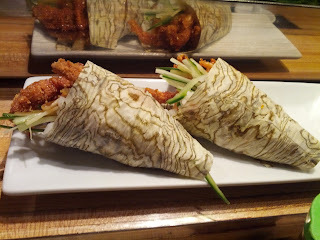 I absolutely loved the crispy shredded lumpia strips, they added an awesome texture and crunch to the dish, in a much more fun way than a standard chip pairing. There were also both black and white sesame seeds for a little extra flavor and crunch. Also on the plate was a plum and sweet chili sauce. This stuff was delicious. Perhaps too sweet to just lap up on its own, but the plum flavor was really infused in it, and came through strongly in the finish. Speaking of flavor. I can't even describe the powerhouse of flavor that this dish was. It was incredible. Such intense flavors, particularly from the plum and ginger, but somehow they all just combined together magically. A bite with all of the components in it was really extraordinary. This dish was really, really good. Great flavors, great textures, just fantastic. It was, hands down, everyone's favorite dish of the night. We'd order again in a heartbeat. Thank you chef for sharing this treat with us! Dungeness crab cake: Brentwood sweet corn relish / sweet corn dill veloute / peppercress / uni. Last time I was at Lot 7, I obviously loved the crab cake, as I declared it the best crab cake I'd ever had. I was tempted to order it again, but I wanted to try more new things. I was very torn about the decision. Do I risk trying something new, when the chances are higher that I'd like the thing I'd liked before? Or, worse, what if I get the dish I'd liked before, and this time my expectations are too high, and I don't like it as much? Such a conundrum! Last time, it was a springtime preparation with asparagus, and this time, it evolved into a summer version with corn. I love sweet corn! It took all my restraint not to order this in addition to what we were already ordering, or to get it again and skip trying something new. Somehow, the chef seemed to have read my mind, as this showed up for us to enjoy anyway! 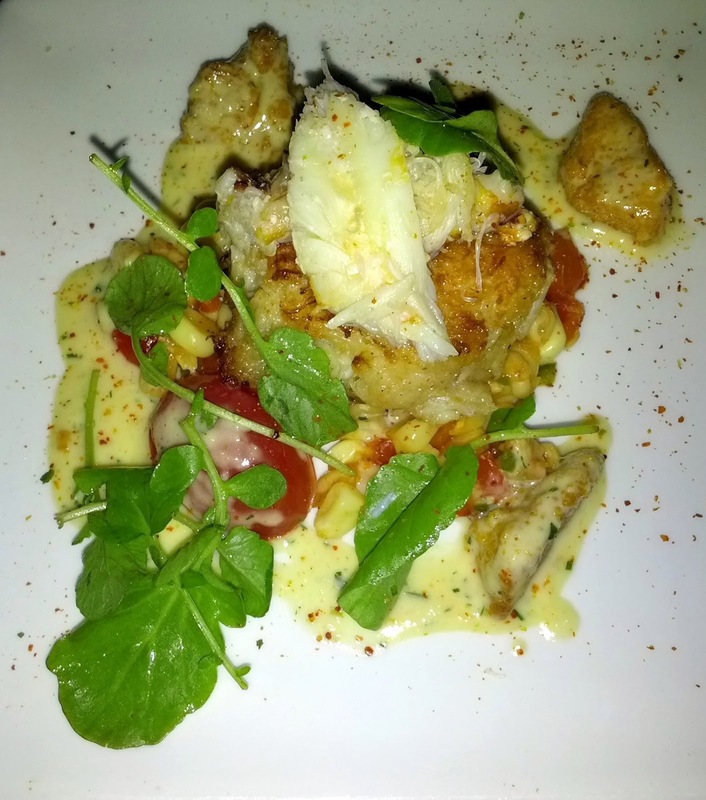 Like last time, it featured a pan seared crab cake topped with additional lump crab meat. I again loved having that extra fresh crab on top, really highlighting the crab flavor that is so often easily lost and masked in a crab cake. The cake itself had plentiful amounts of crab, very little filler. There was also a sweet corn veloute replacing the asparagus soubise from before. I liked having a sauce to drag the cake through, but I didn't find it particularly memorable. The sweet corn and cherry tomato relish was fantastic. The corn was amazingly sweet (gotta love fresh, in season, Brentwood corn!) and paired perfectly with the crab. The cherry tomatoes were slightly cooked, juicy, and incredibly flavorful. The corn and tomato worked great together. The peppercress added a little spiciness and crisp texture as well. Thank you again chef, I'm so glad I didn't leave with buyer's remorse over not getting to try the crab cake! Of the two of us who rated it, this was our 3rd favorite dish of the night. I'm so curious to see where the chef takes this crab cake next. Again, I'm not sure how this compares to the version on the regular menu, $15. I'm guessing this was smaller, and I don't think the regular version has uni. Uni creme brûlée: Fort Bragg uni / yuzu tobiko / salmon roe / paddlefish caviar. $15. And ... the dish I was most excited for. I'm a sucker for custards, like panna cotta or creme brûlée, savory or sweet. I've been seeking out savory custards in particular, whether they be vegatable based (like the asparagus panna cotta from The Village Pub or the English pea and green garlic panna cotta from Radius) or foie gras based, (like the foie custard parfait at Cyrus, the foie gras panna cotta at The Fifth Floor, or the foie gras creme brûlée at The Village Pub). And I sure love some great uni, so I've been loving uni custards all over the place as well, like the uni creme brûlée from Quince, the uni flan from Fifth Floor , and the uni chawanmushi at Alexander's and Commonwealth. I was excited to try yet another variation! As with most savory preparations, this was a play on a traditional creme brûlée. It was served in a small metal container, rather than a traditional ramekin. This threw me off at first, but I think it was really crucial in realigning my expectations. I no longer expected a cold custard, with a hard sugar top, served on its own. The creme brûlée was instead served warm and accompanied by some crostini. The custard itself was creamy, but not particularly uni flavored or remarkable. The custard part at both Fifth Floor and Quince were far more intensely uni flavored. I don't know if the top of it was actually brûléed, if it was, it was lost beneath all of the toppings. I'd normally be sad about missing out on the fun part of cracking a creme brûlée top, but these toppings were far more exciting than a sugar layer! 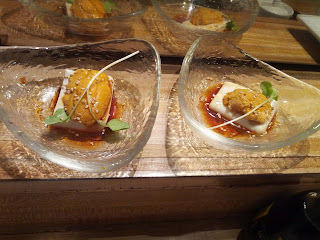 It was topped with uni and an assortment of roe (tobiko, salmon, paddlefish). The uni was amazing. Clearly high quality, fresh, with good flavor, and very generous strips. The assorted roe added some saltiness, pop, and fun texture. It was served with some nicely toasted crostini. They were warm, and not too crisp nor too soft. I enjoyed spreading the custard and roe onto the crostini, not something I would have thought to do originally, but it worked, making this really more of a spread than a creme brûlée. I think the dish could use a re-naming, but then again, calling it a creme brûlée is what got me interested! This was a good dish, and the roe was the most successful topping to a uni custard that we've seen so far. The uni was among the best I've had anywhere, including sushi restaurants. I just wish the custard had more flavor infused in it. I'd order again just for the uni. My 4th pick of the night (two others didn't try it, and the other didn't rate it). $15 was a rather insanely good price for this dish. You can't see it in the photo, but there was a ton of uni on here. I pay more than $15 for this much uni at a sushi restaurant, where it is only accompanied by some rice! Pan roasted wild salmon: lentil and bacon succotash / fresh porcini /dino kale / summer truffle emulsion. $26. For our mains, three of us got the salmon. I'm just loving local salmon these days! I have pretty strong opinions on salmon. I think this is true for all dishes/ingredients that I love, I want them a very certain way. I actually really, really dislike fully cooked salmon. It always seems fishy, too firm, and just like a waste. On the other hand, I love raw salmon in sushi. For a cooked entree, I want it somewhere right in between, medium-rare on the inside. For bonus points, give it a great crispy skin. The salmon was a nice size chunk, but more cooked than I prefer. The thickest part actually was more medium-rare, but the piece varied quite a bit in thickness, and the thinner parts were medium. The salmon had fantastic flavor and was very moist, clearly a high quality product. The amazing part of this dish however, was the skin. One of my fellow diners actually immediately removed the skin upon receiving his dish, and my heart stopped. I somewhat aggressively told him that he needed to eat it (sorry for being a jerk, I just really didn't want him to miss out!). It was perfectly crispy. Perfect. It doesn't get better than this. It was also nicely seasoned, with a great salt level that made it like eating an insanely delicious chip. Accompanying the salmon was a lentil and bacon succotash. It had a smokiness and saltiness to it from the small pieces of bacon, more delicious sweet corn, and lentils. I'm not sure I've mentioned this before, as I never order lentils because I truly hate them, but uh, I hate lentils. I still ordered this dish because I really wanted the salmon, and I'm glad that I did. I did not like the lentils at all, but I acknowledge that they were well cooked, not too mushy, not too crisp, and if I liked the flavor of them, I could imagine it going well with the heartiness of the mushrooms and kale. And the other flavors in the succotash were well balanced and nicely done. But ugh, totally not my thing. Also on the plate were chunks of porcini mushrooms and dino kale. They were both nicely cooked, perfectly salted. The mushrooms were very flavorful and earthy. The sauce on the plate was a summer truffle emulsion, made with black truffles and some cream. It was absolutely delicious, creamy, earthy. I was very full and still had some crostini left over from the uni, and I couldn't resist using it to lap up all remainders of this sauce. Such a good sauce. Amazingly, my dining companion who can't stand truffle also enjoyed this. I think at this point that we have determined that what he finds repulsive must be white truffle oil, not real truffles. This was a perfect portion size, and $26 was great for this quality of fish. Almost everything about this dish was really well done, and in particular it was great execution on the cooking of the fish. Second favorite dish of the night for me, and had it not had lentils and been slightly more rare, I would have been ecstatic. The others who had this dish ranked it as their least favorite of the savories however. The other diner at our table ordered the rare grilled ahi tuna, accompanied by roasted artichoke and marble potatoes in a meyer lemon emulsion with pickled garlic. She said it was good, but preferred the tuna tartar. In particular, she really liked the artichokes included in the dish. Warm banana bread pudding: white chocolate / butterscotch / cashew brittle. $8. When the waitress brought out the dessert menus, everyone had already declared themselves stuffed. But you know I'm a dessert person. And the dessert menu basically read like one created just for me, featuring only 5 items, but every single one of them falls in my list of favorite desserts (in fact, I'm not sure there is a dessert category that I don't like more than these 5!). Even the accompaniments were among my favorite ingredients. We HAD to get dessert. I clearly wanted them all: creme brûlée with raspberries, panna cotta (cheesecake flavored no less! 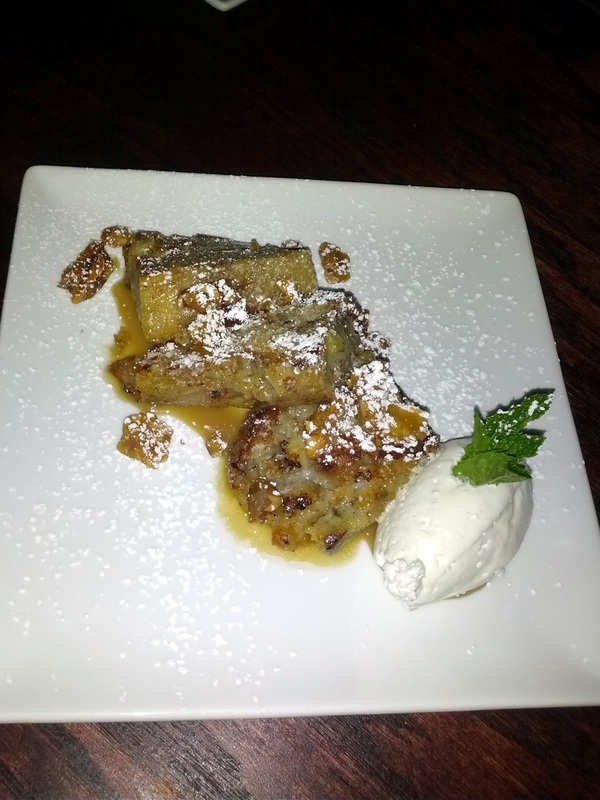 ), warm bread pudding, warm crisp and ice cream, and chocolate mousse with candied pecans and cherries. Oh man. One dining companion immediately ruled out the panna cotta, as he doesn't like it, and we have it all the time (hence the fact that it even has a tag on my blog). He also ruled out the creme brûlée for similar reasons, and given our experience with it last time, I was inclined to agree. And we didn't want caffeine at night, so we ruled out the chocolate mousse. I pressed to get the two remaining desserts, but there were only 4 of us, with one person saying he wanted none, and the other two saying they only wanted a bite, so we asked the waitress which she recommended, and she told us the bread pudding. I love bread pudding. For breakfast, for dessert, anytime. Serve it warm with whipped cream, yes please! And I've been on a white chocolate and butterscotch kick lately too (as froyo toppings mostly), so this sounded great. Unfortunately, desserts are clearly not their strong point, which is sad given how appealing they sound. The bread pudding was served as several slices, garnished with powdered sugar, drizzled with butterscotch sauce, with some bits of cashew brittle scattered on the plate. One thing I love with bread pudding is having a crusty exterior and super eggy moist interior, and this didn't have that. Given the form factor, it reminded the others of french toast, one of them declaring that this should have been called banana french toast instead. It was also very bananay, which I didn't like. This is my own fault however, I somehow missed the word "banana" in the description in my over-joyous reading of the desserts. I don't hate banana, but I'm just a little sick of it. There were also a ton of golden raisins. They were plump and fine, but far too many of them, as many bites were dominated by them. It was served warm, which I liked. The butterscotch sauce was sweet and a good accompaniment. I'm not quite sure where the white chocolate listed in the description was, perhaps in the whipped cream? I mistakenly mis-remembered the dish description and thought this one came with ice cream, and took a huge spoonful of the cream, thinking it was ice cream. Oops! 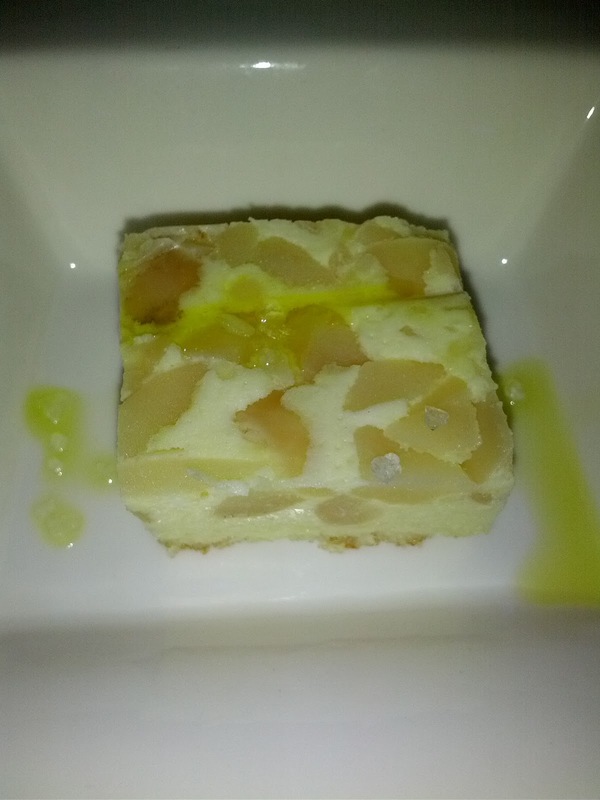 It was decent with the bread pudding, but a big mouthful of it wasn't very enjoyable. It was rather firm for a whipped cream however, we weren't quite sure what to call it. It didn't have any particular flavor. The cashew brittle was my favorite part of the dish. It had a great crunch, it was sweet and salty at the same time, quite delicious. It paired well with the rest of the components, and I would have gladly eaten it on its own. Overall, I really didn't like this. 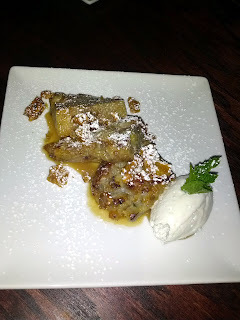 Some of it was personal preference: I prefer my bread pudding in a different style, and just wasn't in the mood for banana. But the others seemed to agree, all ranking it as the second to last dish of the evening. None of us would order again. $8 was a good price for a dessert this size. Red wine poached local berry crisp / vanilla gelato. $8. After we finished the bread pudding, I was feeling pretty unsatisfied. I was so impressed with the earlier dishes that I really wanted to end the meal on a good note. 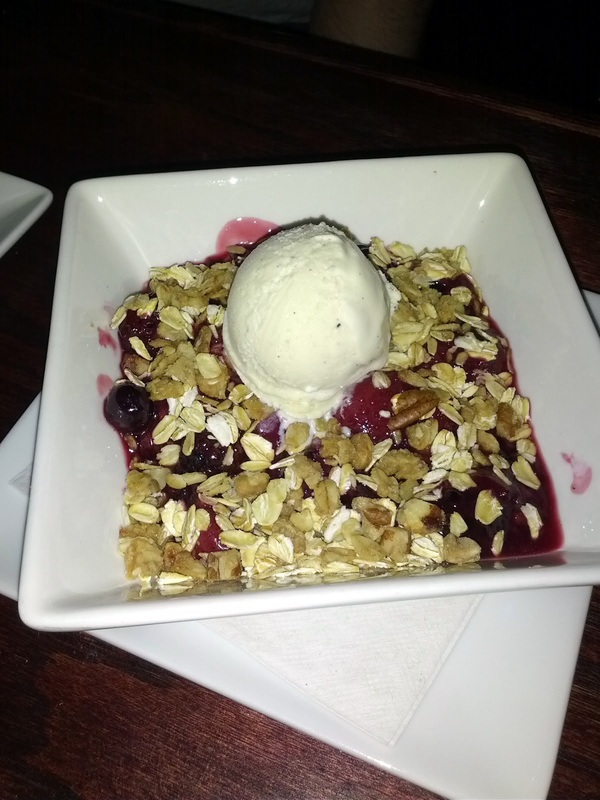 And I just adore a warm fruit crisp/cobbler/etc with ice cream. So, I convinced my tablemates that we needed this, even though they were all beyond stuffed. As you might be able to see from the photo, calling this a "crisp" is a bit of a misnomer. I know crisps can go in a variety of directions with the topping, and some go a little overboard with the amount of crisp on top, like the plum and white nectarine crisp we had at Baker & Banker. But this wasn't crisp at all. The topping was basically just a very thin layer of some oats (and a few nuts) scattered on top. They weren't crispy, and didn't seem to be mixed with butter, sugar, or anything. They were just ... there. The fruit filling was a mix of blueberries, strawberries, and (I think?) blackberries. The fruit was sweet and soft, not extraordinary, but much better than some of the other fruit we've had recently. The strawberries in particular were very good, and seemed to have absorbed a lot of the poaching liquid. The filling wasn't actually very hot, it definitely would have been better served warmer. On top was a rather forgettable vanilla gelato. It paired nicely with the sweetness of the fruit and certainly needed to be there to give the flavor and temperature contrasts, but wasn't anything special. $8 was a good price for this size dessert. Least favorite dish of everyone else, my 5th pick. I wouldn't order again. 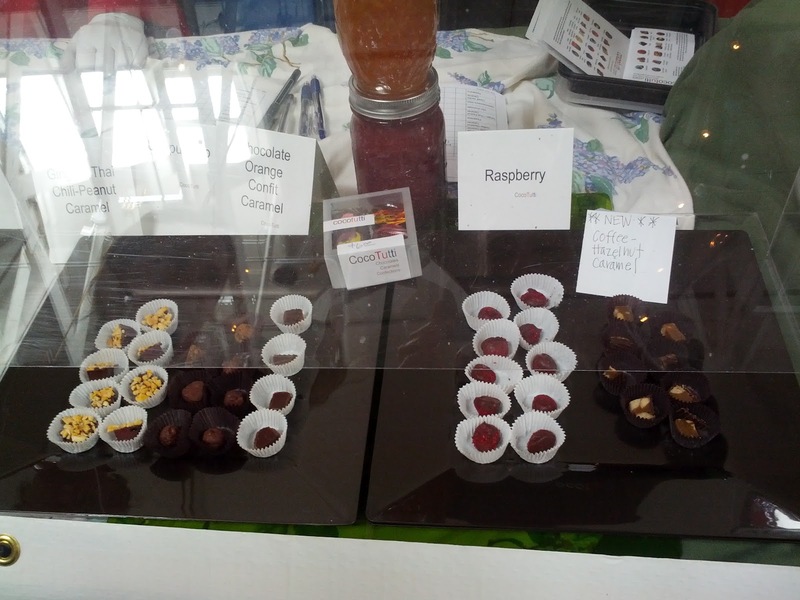 Continuing through my backlog of tasting notes from chocolatiers featured at the SF chocolate salon. Sixth Course is a local chocolatier, sourcing their chocolate from Guittard. They make beautiful shinny chocolates, primarily caramels or boozy ones. Lots of amazing sounding chocolates. I wish I got to try more! Smoked salt caramel: “Rich caramel seasoned with Alderwood smoked salt in a dark chocolate shell” . Ingredients: 61% dark chocolate, organic cream, organic butter, pure cane sugar, smoked Alderwood salt, 31% white chocolate. Tasting notes: Smooth, shiny dark chocolate and white chocolate swirled thin shell, filled with liquid caramel. Very, very gooey. Did not pick up on saltiness, nor alderwood flavor, but there was a flavor in there that I didn’t particularly care for. Chocolate not particularly interesting. Ceylon cinnamon caramel: “An exotic blend of spicy Ceylon Cinnamon infused caramel in a milk chocolate shell.” Ingredients: 38% milk chocolate, organic cream, pure cane sugar, organic butter, Ceylon cinnamon. Tasting notes: Thin milk chocolate shell, filled with smooth gooey caramel. Caramel has a really strong cinnamon flavor. Nicely balanced, not too sweet, quite nice. Bailey’s & cream: “Whipped milk chocolate ganache spiked with Bailey's in a milk chocolate shell”. Ingredients: 38% milk chocolate, 61% dark chocolate, organic cream, organic butter, Bailey's Irish Cream, glucose. Tasting notes: Don’t taste baileys at all. Mediocre milk chocolate shell. Ganache not very smooth. I don't only eat out at restaurants. I also eat a lot of chocolate. Every morning, I enjoy at least one chocolate with a cup of coffee. A friend and I meet up around 11am, with one of us bringing a new chocolate offering to try out. We've worked our way through a LOT of chocolates this way. I also was a member of a weekly chocolate tasting club, until it ended a few months ago. And I've visited a number of chocolate festivals. So, I've tried a lot of chocolates, and have a big backlog of chocolate reviews to get through. On nights where I don't go out to eat, I'll try to post one of these instead! One merchant that I have seen popping up at a lot of local events is Cocotutti. They make tiny little chocolates, always beautifully colored. They are also notable in that they always bring plenty of samples of a variety of different chocolates, and encourage you to try numerous ones. The merchant is always friendly and gracious, even when dealing with crowds of people frantically grabbing for the chocolates (like as the SF Chocolate Salon). If you see them around, check them out! As always, subsequent tastings are noted [in brackets]. Bon bons - tiny little balls of chocolate. Cappuccino: Tasting notes: Same fudgy chocolate that doesn’t have much chocolate flavor. Mild cappuccino flavor. Blackberry: Tasting notes: Same fudgy consistency, same not very chocolately. Blackberry flavor is pretty subtle, but discernible. Very similar to raspberry one. Earl gray: Tasting notes: Same thing, flavor too subtle, barely any earl gray, rolled in white powder. Florentine caramel: “liquid caramel with fresh citrus and roasted almonds”. Tasting notes: very runny caramel filling that has a strong citrus flavor. Coated in forgettable milk chocolate and topped with almonds. Not sure the toasted almonds added anything. Thai Chili Peanut: Tasting notes: liquid caramel filling, dark chocolate coating, topped with almonds. Filling had very strong chili flavors. Really nice. Liquid vanilla caramel: Tasting notes: Chocolate shell filled with runny caramel. Not particularly interesting, nor non-interesting. Coffee hazelnut caramel: Tasting notes: Good coffee flavor, decent overall. Truffles - hand dipped in either 64% Guittard or 40% Valrhona chocolate. Jasmine: Tasting notes: Dark chocolate shell, milk chocolate filling, didn’t really taste any jasmine at all. Peanut butter: Tasting notes: nice creamy peanut butter inside, milk chocolate outside. Like a very tasty pb cup. Quite good. Peanut: Tasting notes: Nice chocolate, little chunks of marshmallow, peanuts go well with it. Good mix. Sunday nights. Sigh. Always a night that I want to eat out, but so few options. Many places are not open, and those that are usually do not have their executive chefs working, and none have fresh fish. And I was going to be dining with a vegetarian, so steakhouses were out. Italian seemed like a great fit, particularly as I've been on a quest for some good pasta. I've had some decent italian in the city, but nowhere recently that has really made me want to go back (except for Quince, but that is a formal, pricy experience, or Cotogna, which while casual and the right price requires reservations way too far in advance). Any recommendations? I'm really just looking for fresh pasta, cooked al dente, with some delicious sauce. So we headed to Seven Hills, in Nob Hill. Open on Sundays, they take reservations, and they get very good reviews. Upon entering we were greeted by Alexis, the charming owner, and were seated immediately. I liked the feel of the restaurant, it was casual and very welcoming. Service was good, friendly, just the right level of attentive. Share plates and utensils were brought out, dishes cleared in a timely fashion, etc. Water was provided in a jug left on the table so we could refill as needed. The food was all good, and prices were very reasonable, but nothing was remarkable. It felt more like eating a good meal at someone's home, rather than eating restaurant food. I don't mean that in a bad way, but there was nothing to elevate it to a level where I'll remember it in a week. Ingredients were good, execution was decent (although the pasta was universally overcooked), and it seemed like a lot of care went into the dishes, but at the end of the day, they really were just exactly what you expected from reading the descriptions. I'd go back if someone wanted to, but I'll continue to try other places first. 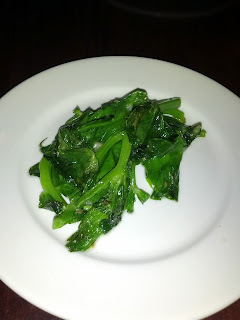 Sautéed pea tendrils with garlic. $4. Upon sitting, we were presented with 3 menus: the standard menu, the wine menu, and another, titled "While you decide ...". It includes a bunch of little bites, mostly finger foods in the $4 range. Note that these are not appetizers, as the main menu includes those ($8 - $12). This is a cute idea, and not something I'd seen before. We were intrigued by the pea tendrils, which seemed like a really fresh, seasonal delicious treat. What we got was exactly as advertised ... just some pea tendrils sautéed with olive oil and garlic. Nothing more. They were tender, fresh, and tasty, but nothing that any of us couldn't have easily prepared at home. This started the theme of the night of home cooking, rather than fancy restaurant food. We mostly just found this dish amusing. We knew it would be smaller than an appetizer, but there were only 5 tendrils on the plate. $4 is cheap, but for 5 tendrils? Amuse bouche: butter bean and garlic frittata. After we ordered, an amuse bouche arrived, a little square of butter bean and garlic frittata, drizzled with some olive oil. The olive oil was high quality, the salt level was spot on, but there wasn't a lot of flavor in the butter bean nor the frittata. It had a very slight eggy aftertaste. Not remarkable. 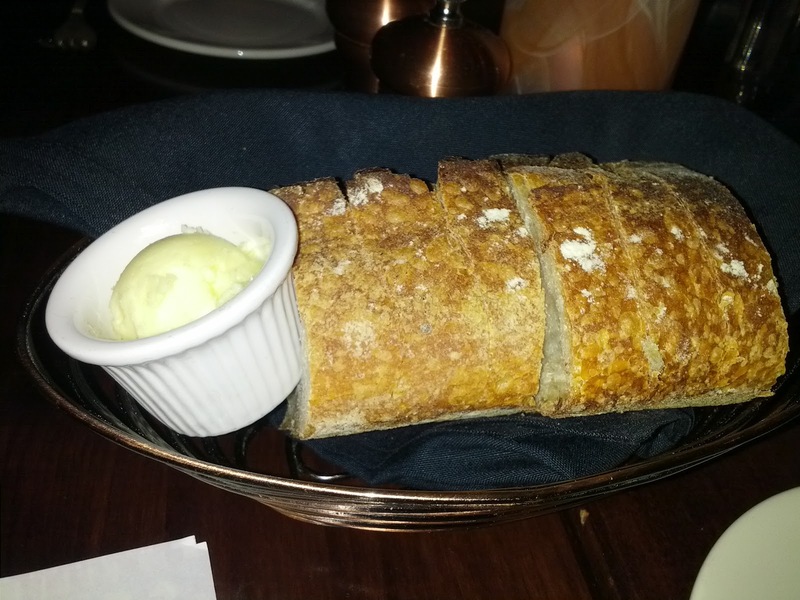 Bread service was ... sourdough bread. Served slightly warm, definitely not hot. Not nearly warm enough to melt the butter. It had a good crust, a soft interior, but was sourdough, which you probably know by now that I can't stand. The butter was really flavorful, high quality. Burrata: tomato water, radish, sun gold cherry tomatoes, Arrowsmith Farms micro basil, green onion, Trapani sea salt, Sicilian extra virgin olive oil and balsamic vinegar. $11. I'm a sucker for burrata. I love it. Such creamy deliciousness. Whoever thought up stuffing cheese with cream is a genius! And tomatoes are just starting to be delicious, so this sounded pretty fantastic. This was pretty much exactly what I expected. Creamy, fresh, tasty burrata. Not any more notable than any other burrata. The radish was crisp and really flavorful. I thought it was a little strange with the burrata, but it was enjoyable. The cherry tomatoes were perfectly ripe and also quite flavorful, but there were only a few of them. I would have liked more actual tomatoes. It was all finished with a big pile of micro basil, green onion, salt, olive oil, and balsamic vinegar. The greens didn't add much, but the oil and balsamic went nicely with the cheese. The star of the dish, surprisingly, was the tomato water. It was really light, and intensely flavorful. It was really quite delicious. It made me really, really wish I liked sourdough so I could use the bread to soak it all up. Those at the table who like sourdough did so, and said it went really well. I resorted to just drinking it by the spoonful, like a chilled tomato soup. My second favorite dish of the evening, and I'd order it again. $11 for this portion seemed reasonable. The burrata came with some hot buttered (or possibly oiled?) 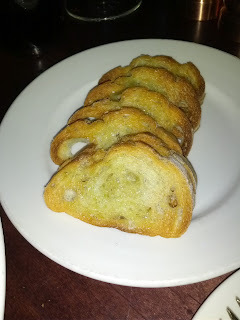 slices of crostini. They were lightly toasted, so mostly soft, which helped them soak up the tomato water. Crostini topped with burrata with tomato water spooned over it was a winning bite. 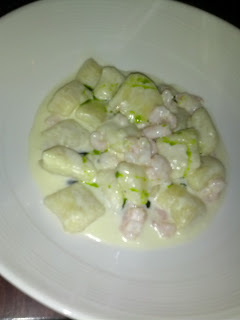 Red potato gnocchi, fresh bay shrimp, fennel oil, Fontina cheese cream sauce. ( Half portion). $10.50. All pastas were available in half or full sizes. Since we weren't starving, we opted for the half sizes. Given the starters and our desire to save room for dessert, these were the perfect size. The gnocchi were well executed. Fluffy, light little pillows of potato, but I wouldn't have known they were red potato (nor do I really care). They were some of the fluffiest gnocchi I've ever had, really reminding me of mashed potatoes. The shrimp were small bay shrimp, cooked well enough, but they didn't really add anything to the dish, besides a fishy aroma. The sauce was quite delicious, cheesy, but not too heavy feeling. It was finished with a little fennel oil, which gave it just a slight essence of fennel and additional depth. The dish arrived piping hot, clearly fresh. Given how many times we've recently received cold food, this was particularly notable. $10.50 seemed like a great price for this size dish. It was total comfort food, basically cheesy mashed potatoes. My favorite dish of the evening! Spaghetti with Grandpa George’s Sausage, caramelized onions, bell peppers and tomato sauce. (Half portion) $10.50. The spaghetti is one of their famous dishes, one of only two that is always on the menu (the other is the Ravioli Uovo, but since that contains truffle oil and my dining companion hates truffle oil, we didn't try that one). We obviously had to try one of their famous dishes! The spaghetti wasn't traditional style at all, it was more like pad thai noodles, which surprised me. They were well flavored and clearly fresh, but overcooked, much past al dente and bordering on mushy. This was disappointing, as their pasta is all homemade and where they are supposed to shine! The sauce was just a basic red sauce. It honestly didn't seem much better than anything I could buy at the grocery store. There was some small chunks of bell peppers in the sauce, that were also overcooked and very mushy. I didn't find any of the caramelized onions, although I was looking forward to them. The sausage was supposed to be the star of the show, a old recipe from "Grandpa George". 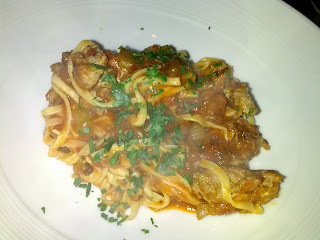 I liked the form factor of large, uneven chunks and there was a plentiful amount of sausage in the dish. Unfortunately, like the sauce and pasta, it was completely unremarkable. Like the gnocchi, this dish arrived nice and hot. Parmesan cheese was shaved over it tableside. The half size portion was again a great size, and $10.50 was a good price. My least favorite of the entrees, and I would not order again. It really reminded me of something any of my friends, or myself, could have easily prepared at home. I asked for a wine recommendation, as I love a nice glass of red wine with my pasta. The waiter recommended a Sangiovese Blend, Chianti Classico, Felsina Berardenga, Italy, 2009, $12. The wine by the glass was served in a little carafe, with the waiter pouring the initial bit into your glass, and then leaving the carafe at the table. It was cute, but I didn't really see the point, as it was just a single glass worth. I didn't care for my wine at all, it wasn't very smooth. One of my other dining companions ordered a Malbec, and his arrived really cold, and he had to wait for it to warm up. Wine does not seem to be their strong point. Euvitis wild mushroom tortelli, brown butter, thyme and grated pecorino cheese. $21. One of my other dining companions went for the mushroom tortelli, basically, large mushroom filled ravioli. He opted for the full size, which was a ton of ravioli. They actually made a mistake and brought him only the half size originally, but acknowledged it as soon as they brought it, and brought him the second half before he'd finished the first. He probably wound up with hotter pasta the whole time this way, so it wasn't really a big deal. Being my curious self, I of course wanted to steal a bite. He graciously gave me an entire tortelli. The pasta was again a little overcooked, not al dente, not a nice chew on it. The filling was very finely chopped wild mushroom, and it just seemed like mush. Flavorful mush, but the mouthfeel was not very pleasant. It was finished with a brown butter sauce that was just kinda oily and not very flavorful. I liked the flavor of the mushroom, so I ranked it above the spaghetti, but barely. I wouldn't order again. 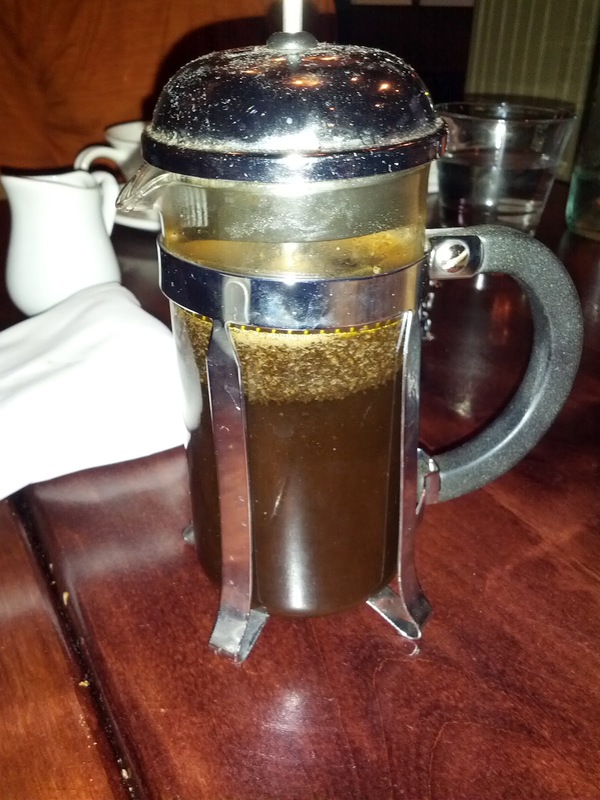 Weaver's coffee, decaf french press. $3.25. Coffee was from Weaver's, served in individual french press, with a pitcher of cream (I'm pretty sure it was cream, not half and half, as it was very, very rich). The coffee was excellent, very bitter, a lot more complex that most decaf. It did arrive fairly far in advance of the desserts however, which I did not like, since I like to have sips of my bitter coffee to balance out the sweet dessert. I also appreciated that the waiter said "decaf french press" as he sat it down, confirming without my asking that it was decaf (you'd be surprised how many times I double check, and find out that they had brought me regular!). $3.25 for a full french press was a good price. 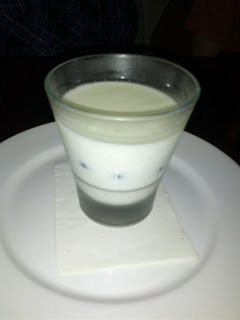 Butermilk panna cotta, wild blueberries, coconut water. $8. And time for desserts, my favorite part of the night! Most of the desserts on the menu sounded great, so I had a hard time narrowing it down to just two. As you know, I love a good panna cotta. When I asked the waiter about the different desserts, he told me this was his favorite. They always run some variation of a panna cotta on the menu. It was served in a glass, so I wasn't able to do my standard wiggle test. It was a decent consistency, decent flavor with a slight buttermilk hint to it and not too sweet, but, like the other dishes, fairly unremarkable. There were some blueberries in it that didn't really add or detract from it. The coconut water on top was a nice touch, with a slight coconut flavor that really enhanced the dish. It was also fun to have the more waterly liquid in there. $8 was a fine price for this, and it was my favorite dessert of the night, but it was not very notable, and I wouldn't order again. 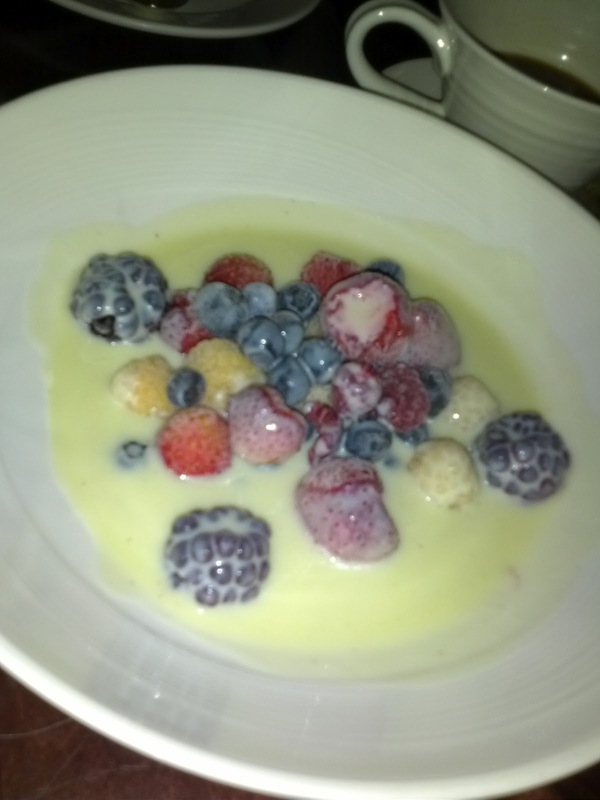 Frozen wild mixed berries, warm white chocolate crème anglaise. $9. This dessert sounded intriguing, and potentially right up my alley. One of my favorite simple little treats to make for myself is some frozen berries, topped with whipped cream, nuts, and granola. I pretty much always have a freezer stocked full of frozen fruit and nuts, a can of whipped cream in the fridge, and granola in the pantry, so this is a fun little play on a fruit crisp or crumble that I can make for myself on a whim in about 30 seconds flat. Which I do, at least several times a week. I love how frozen berries turn into something almost like ice cream, yet while still tasting like delicious fresh fruit. I also have a thing for crème anglaise. We've been known to lap it up by the spoonful on numerous occasions when it comes as a side for a dessert. I still dream of the crème anglaise that comes with the souffle at Alexander's! Anyway, the description of this dish sounded a little boring, frozen berries with warm white chocolate crème anglaise, but given the $9 price tag, I assumed there must be more to it. I was wrong. We were brought a bowl with a few types of berries in it, raspberries, blackberries, blueberries. Then the server poured the warm sauce over it tableside. And ... that was it. Exactly as advertised I guess. The fruit wasn't particularly good nor flavorful. Seemed like generic frozen grocery store fruit. I guess I'm spoiled as I freeze all my own fruit fresh from the farmer's market, but I was surprised at how flavorless the berries were. The sauce was just sweet. It didn't offer anything. None of us liked this dish. We all were surprised by the lack of flavor. $9 for this dish made no sense. While the prices of all other dishes that night seemed very reasonable, this seemed far overpriced. It was small, and not complicated in any way. Even more strangely, it was more expensive than the panna cotta, so it isn't like they just had one fixed price for all desserts. Worst dish of the night for everyone, and we obviously would not order again. My epic quest to eat massive amounts of foie gras has been forced to come to an end, so it was time to find a replacement. I was looking for another ingredient that I love, that has strong flavor, creaminess ... and it struck me: uni! And what better way to start of my uni crawl, than with the most simple preparation ever: sushi. I have a backlog of sushi places I want to try, and one of them, Zushi Puzzle, actually takes/requires reservations. And they are known for their uni, in two different preparations - one of live uni and one with some tofu. I've tried to go several times, but was never able to get a reservation. The holiday weekend seems to have helped, as I was able to easily get in the first seating. As always, I did extensive research before going. 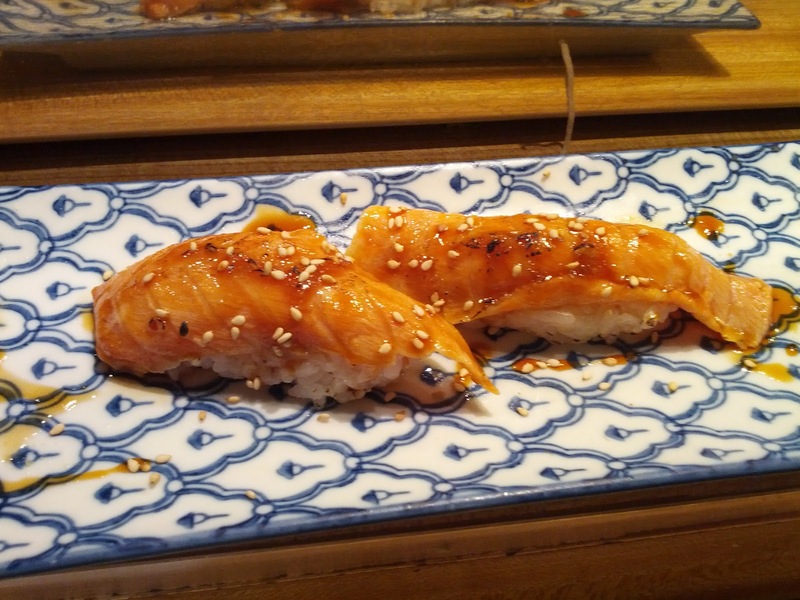 The reviews were universal: you must sit at the sushi bar, and you must order the omakase. Done and done. The sushi bar seats only 8 people. When we arrived for our reservation, we were told at that the chef was not ready for us yet, and were asked to sit in the main dining room for a while. This seemed a little strange, why couldn't we just sit at the bar while he prepared? Anyway, we sat out at a table just waiting for about 15 minutes, as did everyone else with sushi bar reservations. The restaurant was incredibly spacious. There was a lot of space between tables, the bathrooms were huge. They could clearly seat many more people, but have chosen not to, probably due to the speed of the kitchen. Once we were moved to the sushi bar, we got to meet the main sushi chef, Roger. He was in charge of all of the nigiri/sashimi. Off to the side was the rest of the kitchen, with a chef making all of the rolls, and another making all of the cooked items. The bar was decorated with an eclectic mix of items: a stuffed blowfish, a giant crab shell, awards he has won, a beautiful orchid, a fresh wasabi root. Roger made the entire night very memorable. He started off asking the couple next to us what they wanted. They said "omakase". And then he asked them for more details - what do you like, what can you not stand. They didn't really say much, so he launched into an explanation, explaining that he had 7 types of salmon, 5 types of tuna, 3 types of mackerel, etc, etc. That they have cooked dishes, rolls, nigiri. There are a zillion different omakase menus he could come up with, and he doesn't have a fixed one like some places, he wants to make you what you want. They gave a few vague preferences, as did the others seated at the bar. I, on the other hand, knew exactly what I wanted to tell him. No avocado or watermelon, since I'm allergic. Love uni. Love salmon. And my dining companion can't stand truffle oil (which I knew they used there). He served most of us the same first few dishes, but branched out near the end of the meal. We had a massive amount of food. Far more than we intended to, as can be the danger in omakase. We were already pretty full when he sent a platter of 24 pieces of sashimi our way (there were only two of us). The experience of sitting at the bar was quite memorable. Roger was talkative, and his open conversation with everyone encouraged us all to chat with each other. We got to know everyone else seated at the bar. Roger also took the time to ask our names, and addressed us by them throughout the night. He really made the experience. He also taught us a number of things along the way, like the proper way to eat uni (mush it in your mouth, don't bite), how to eat nigiri (put a dot of wasabi on it, flip it sideways), and how to handle the fish (don't touch it too much, or you make it warm). At one point, I saw him preparing sliced beef nigiri, on top of which he put two different white substances, and then blowtorched. I couldn't quite identify what went on top, it sorta looked like monkfish liver, but that seemed like a strange thing to torch. So I asked him, and he told me that one was kobe beef fat and the other was ... foie gras, compliments of the chef, of course. If I hadn't been stuffed at that point, you know what I would have ordered! Overall, the food was good. The fish was all clearly very fresh, served at the proper temperature, and had really good texture. 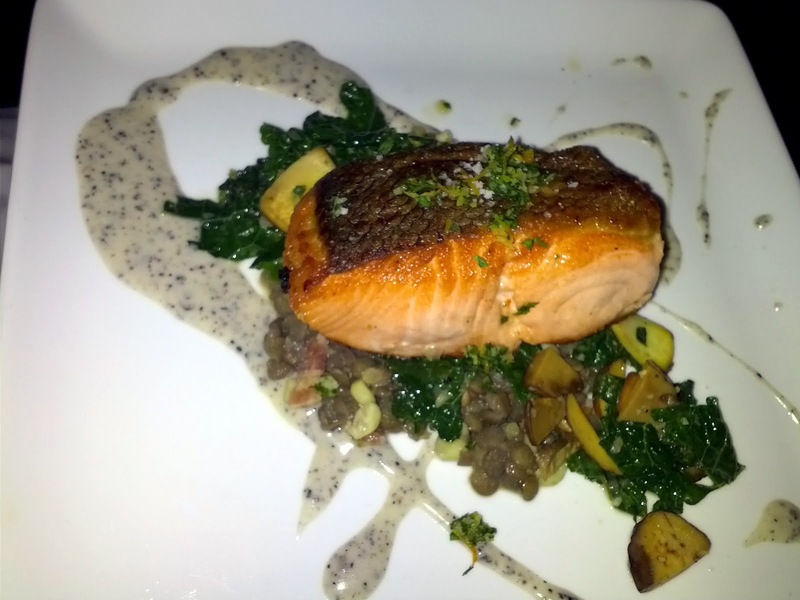 Most of it wasn't all that flavorful or notable however, with the exception being his phenomenal salmon selection. The selection in general was quite impressive, with a lot of fish that you don't commonly see, and many varieties of the same type of fish. Prices were fine, not particularly high nor low. I'd go back if someone wanted to, and I appreciate being able to make reservations, but my list of sushi places to try is long, and this wasn't better than other places I've been, so I'm in no rush to return. 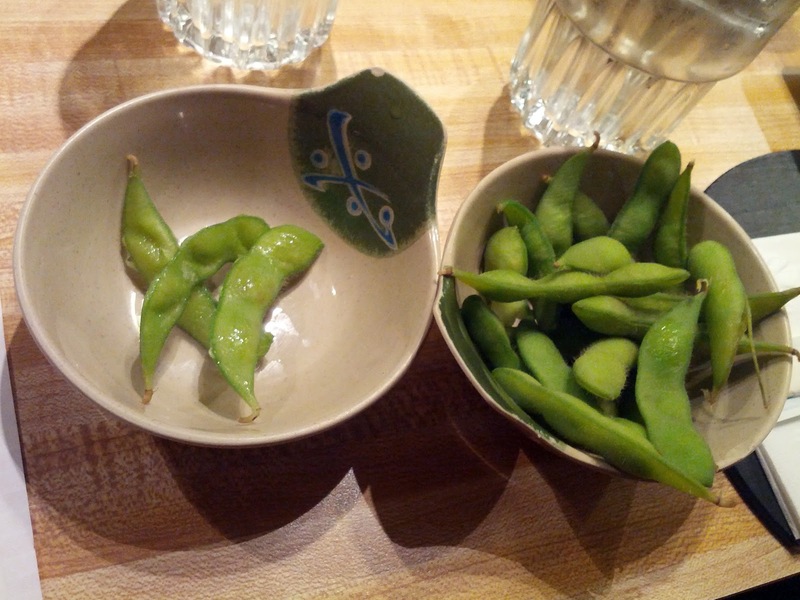 To begin with, we were given some rather unremarkable complimentary edamame. There was nothing wrong with it, but it was served cold, and not salted. Least favorite dish of the night. Best Hand Roll. $6 each. Inside the roll was spicy tuna, cucumber, rice, and tempura soft shell crab. Not something I'd ever normally order as I don't tend to care for soft shell crab, but this was really interesting! The crab was really nicely tempura'ed, crispy, and crunchy. Obviously deep fried and with a lot of batter, but it wasn't oily. The cucumber added another nice crunch. And then, contrasting with the crunchy elements, was the mushy spicy tuna and rice. I really liked the contrast of textures at play there. The spicy tuna was just barely spicy, and it seemed like there was too much rice, as it overpowered the other flavors, and I could barely taste the tuna at all. The wrapper was unlike anything I'd seen before, it was some form of seaweed. It got soggy very quickly as the sauce inside the roll saturated it. Overall, this was creative and fun to eat, and my 8th favorite dish overall. $6 was a good price for the large handroll. I wouldn't be opposed to getting it again, but I'd probably try something else instead. Uni (Santa Barbara and Mendocino), on tofu. $17. I mentioned at the start of the meal that I really liked uni. The others at the sushi bar had either never had uni, or had it once before and didn't like it. Chef Roger told them that he really wanted them to try it, and that he'd teach them how to eat uni so they could like it. His instructions were to not bite into it, but rather, just mush it in your mouth. He demonstrated by trying a piece of both types of uni he had available that night, one from Santa Barbara and one from Mendocino. For the others, he picked the milder, creamier one. He was going to serve all of us the same uni, but I asked to try both of them, side by side, to compare. Unfortunately, I lost track of which was which, but one was indeed a lot sweeter and creamier. Neither had a very strong uni flavor however, and I was pretty disappointed with it. The uni was served on top of a little piece of tofu, and was dressed with soy sauce and sesame seeds. The creamy tofu helped make it more user friendly for the beginning uni eaters, and it was interesting to have that texture. It reminded me a little of the uni crème brûlée sort of dishes we've had lately. Certainly interesting, but I think I would have preferred standard nigiri. My dining companion thought there was way too much soy sauce on here, and said that is why we couldn't taste the uni. It didn't seem overly sauced to me, but I agreed that the uni flavor was far too mild. My 10th pick of the night. $17 for the pair of uni seemed pretty high, particularly given the small amount of uni on each. 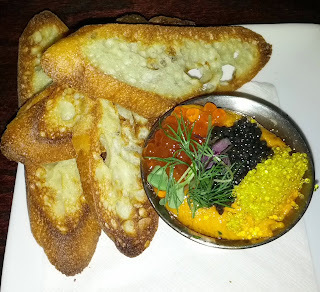 I'd get this again, but mostly just because I desperately want to find some good uni! Live scallop part 1. $16.95. Next up was the live scallop. He opened the shells in front of us, and showed us the scallop, and the foot. He quickly chopped up the foot and sent it away, telling us we'd see it again soon. The scallops were HUGE. Probably the biggest I'd ever seen before. He sliced them up thin, made into nigiri, and served with thin slices of lemon and ponzu sauce to dip into. The scallop was insanely tender, really soft, and just kinda melted in your mouth. Slightly sweet, but a very mild flavor. 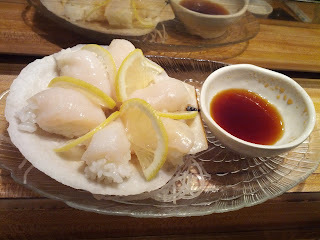 The ponzu sauce was tart from the vinegar and went well with the scallop, since it didn't have much flavor on its own. This was clearly fresh and a really great texture, and probably the best raw scallop I've ever had. My 9th pick of the night. Not something I'd go out of my way to order again however. Live scallop part 2: tempura scallop foot, tempura onions, ponzu dipping sauce. A little while later, the rest of the scallop was brought back to us. 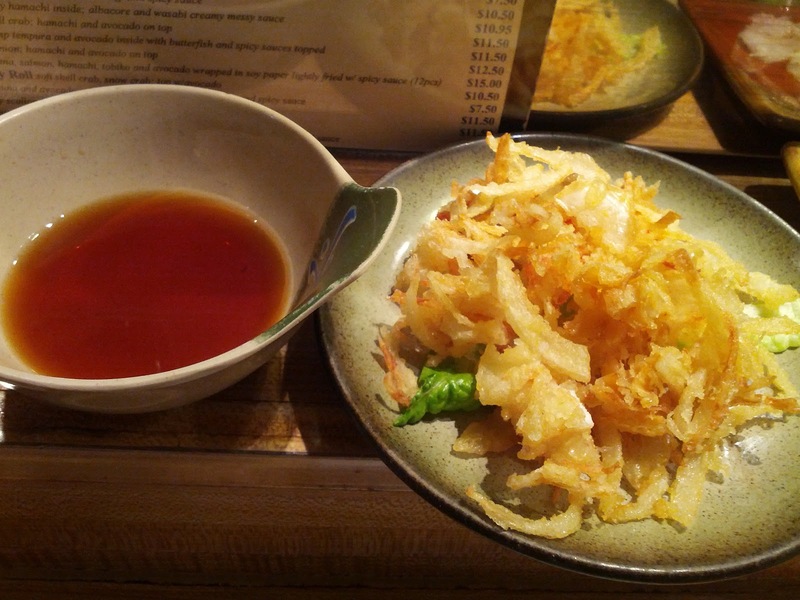 The foot had been chopped up, battered, and turned into tempura, along with some thin slices of onion. I liked this more than the last live scallop preparation we had at Kiji. The scallop foot was still pretty chewy. There is a reason this part is often discarded! I didn't really like it at all, it reminded me of bad calamari (the sort of calamari that makes people think they don't like it). But the crispy tempura onions were another story. So tasty! While I was there to get raw fish, I certainly filled up on the onions. Like the other tempura items we received, they were perfectly crisp, not too oily, and the batter was really tasty. This made me crave onion straws/onion rings and burgers. Since I loved the tempura onion so much, this dish came in as my 12th favorite of the night, even though I didn't like the tempura scallop. Fresh wasabi, ginger, fake wasabi. About this time, we were presented with fresh wasabi, ginger, and fake wasabi. 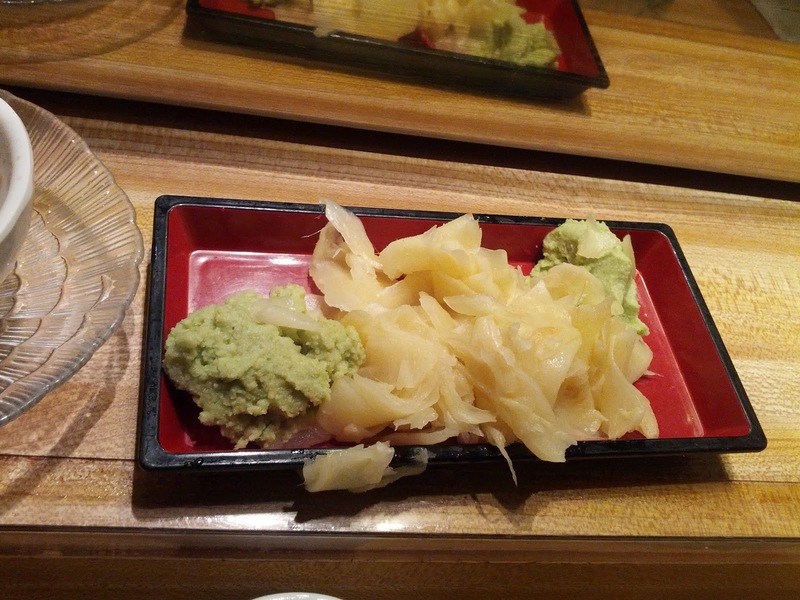 The fresh wasabi was surprising in that it had a ton of kick, and I usually find fresh wasabi fairly mild. The ginger was also not standard, in that it was fairly sweet, and not all that pickled. Chef Roger asked if everyone liked halibut. Everyone sorta nodded. 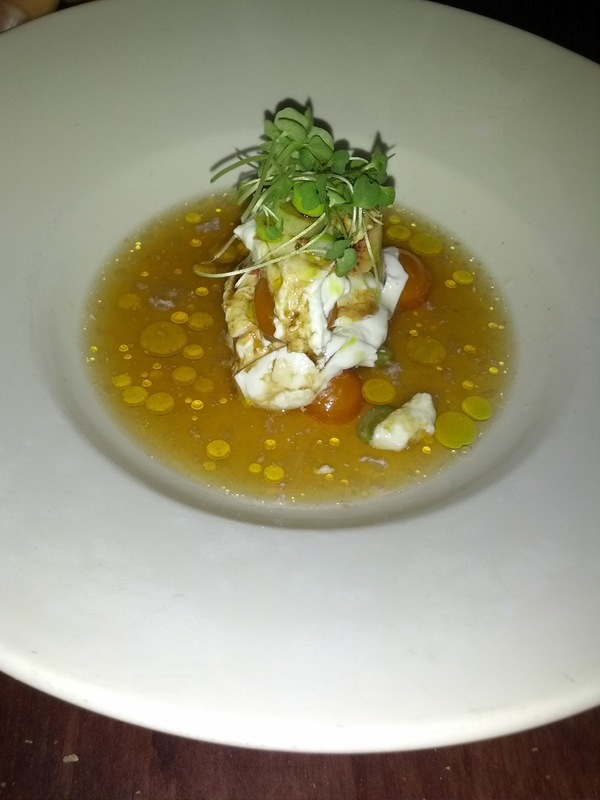 I haven't had much raw halibut, and couldn't really remember if I liked it much or not. While I was sitting there pondering this, he whipped out a whole halibut, and slapped it down on the board in front of him, and then set to work breaking it down. It was absolutely fascinating watching him slice it up, making it look so easy! At one point, one of our fellow diners asked, "Did you just cut that with your fingernail? ", because Roger was so fast, that he didn't actually see him use the knife! Very impressive knife work, and he even gave us a little knife skills lesson along the way. We learned a lot of random things throughout the night! 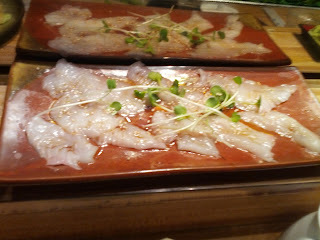 He sliced the halibut very, very thin, carpaccio-style, and dressed it with soy sauce and truffle oil. Since my dining companion does not like truffle oil, he gave me the truffle oil on the side to dip into instead. The halibut was clearly very fresh, and very tender, but just didn't have a lot of flavor. It didn't really do anything for me. The truffle oil dipping sauce was on the sweet side, and I didn't taste any truffle in it. Nor did my dining companion, who I convinced to try it out. The best part of this dish was watching the preparation, I wish it had been more successful tasting, but I did enjoy watching the chef do his work, and appreciated how fresh it was. My 11th pick of the night, and $16.95 seemed a little expensive for something that just wasn't that great. I would't order again. Sashimi - 24 pieces. $56.75. And next up came a huge platter of sashimi. I was actually feeling pretty close to being done before we started in on this. 1 big hand roll, 2 types of uni, the scallop nigiri, the tempura, and the halibut made for a light, but close to complete, meal. He asked the couple next to us how much more they wanted, and they said 4 pieces of nigiri. He asked us if we preferred sashimi or nigiri, and I said sashimi. I kinda assumed he'd stick with the 4 pieces, or perhaps just a little more since we were getting sashimi instead. When he pulled out this massive plate, I knew we were in trouble! Since I'd expressed that I liked salmon, we got 4 types of salmon. Since my dining companion said he liked hamachi, we got 3 types of hamachi. Since he said he liked tuna, we got also got 3 types of tuna. And some walu and kampachi. OMG. The slices were all quite generous as well. All of the fish was a good, firm texture, served at the proper temperature, not too cold, not too hot. But, most of it didn't wow me. Then again, I wouldn't have picked most of this, and didn't really realize what I was getting until it was too late. The salmons, which is what I was most in the mood for, were the highlight of the night. Copper river salmon. A really thick piece, full of flavor, and a beautiful dark orange color. My favorite piece of the night. Scottish salmon. This also had a great flavor, and was a really smooth texture. Not quite as flavorful as the copper river, but a very close second. $5. Wild king salmon. More mild that then other salmons, with far less flavor. My 4th favorite overall. $4.50. Ivory salmon. Silky smooth, but a little chewy. My 5th favorite overall. Inada (baby yellowtail). Very tender, very mild. I'm not a huge hamachi fan, but it turns out the babies are tastier than the adults ... my 6th pick overall. $5. Kampachi (ambjerack). Another pretty mild fish, good texture, but not much flavor. 7th pick overall. $6. Hamachi (yellowtail). Fairly standard hamachi, good firm texture, but pretty forgettable. 13th pick overall. $4.50. Toro (fatty tuna). Very buttery, as fatty tuna should be, but not nearly as good as other toro I've had. 14th pick overall. $11. Buri (giant hamachi). Very firm, almost hard to bite into, and rather fishy. I didn't like this one much at all. 16th pick overall. $5.50. Walu (butterfish). I normally really like butterfish, and this was nicely buttery, but too fishy. 17th pick overall. $5. Maguro (bluefin tuna). I'm starting to think I just don't care for raw red tuna very much. This just tasted too minerally for me. 18th pick. $5.50. Ahi (big eye tuna). And even stronger tasting than the maguro. 19th pick. $4.50. The salmon were clearly my favorites of the night, and like I said, these were all generous, good cuts of fresh, quality fish, they just really weren't nearly as flavorful as I would like. Of the sashimi, the only ones that I would order again are the salmon. I was insanely full at this point, but the salmon had been the highlights all evening, and I saw Roger preparing this for someone else and it looked fantastic. How can you say no to amazing salmon? This was salmon, topped with a little lemongrass gel (I think that is what he said), that he then seared with a blowtorch, and garnished with soy sauce and sesame seeds. The flavor wasn't as strong as when we'd had it raw, but I loved the slightly grilled flavor it had, and the contrast of the hot outside with the cool inside. It was perfectly barely seared. My 3rd favorite piece for the night. 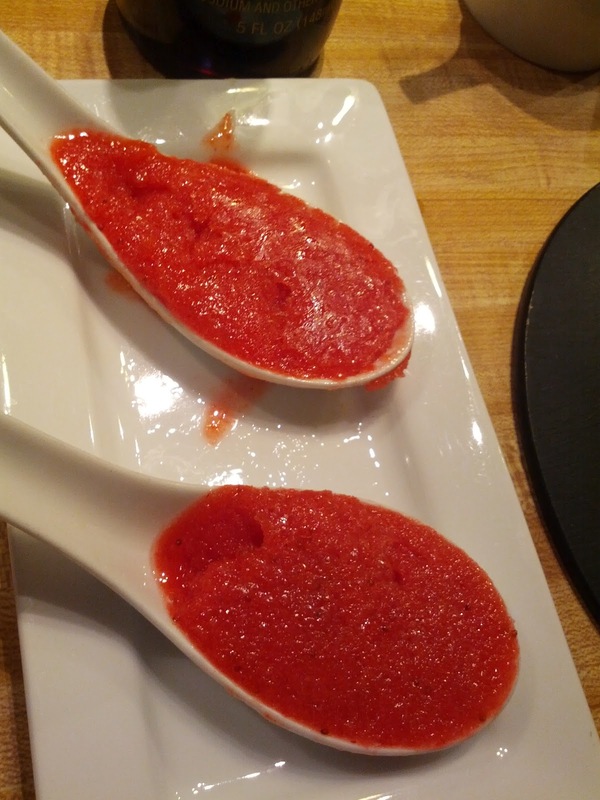 To finish the meal, we were each given a spoonful of strawberry sorbet. It was insanely sweet, but had a very nice strawberry flavor. On the icy side, but that is how sorbet is. I wouldn't have liked this much on its own, but Roger had us each hold out our hand, into which he scooped a little ball of wasabi ice cream (he didn't tell anyone what it was, just told us to eat it). It had some serious kick and was nice and creamy. After taking my initial bite on its own, I decided to combine mine with the sorbet, and enjoyed both the ice cream and sorbet more that way, with the wasabi ice cream cutting the sweetness of the sorbet, and the sorbet cutting the bite from the wasabi. This wasn't really a fantastic dessert or anything, but was unique and unlike the end of any sushi meal I've ever experienced. And not that I could have eaten any remotely substantial dessert at that point anyway! 15h pick of the night.